On Independence Day in a typical year, fireworks account for two out of five of all reported U.S. fires, more than any other cause of a fire. More than half of fireworks injuries in 2013 were to extremities, including the hand or finger, leg, and arm. Most of the remaining lesions were to parts of the head, including the eye. So how can you celebrate the holiday safely? 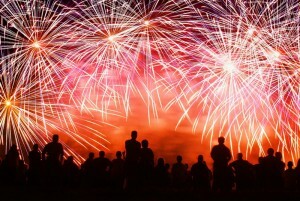 Attend professional fireworks displays put on by trained professionals. Let’s face it. They’re far more spectacular than anything you’d see in someone’s backyard. Even Debbie Downer would be hard-pressed to complain. Check out our fireworks safety page for videos like the one below and infographics to learn just how dangerous consumer fireworks can be. Additional fireworks statistics are found here-> Fireworks Report.